Read Part I of this blog here. Commemorative ceremonies marking the 70th anniversary of the Dieppe raid were larger and a little bit more poignant this year. With most of the veterans now in their 90s this may have been the last major commemoration of the raid. 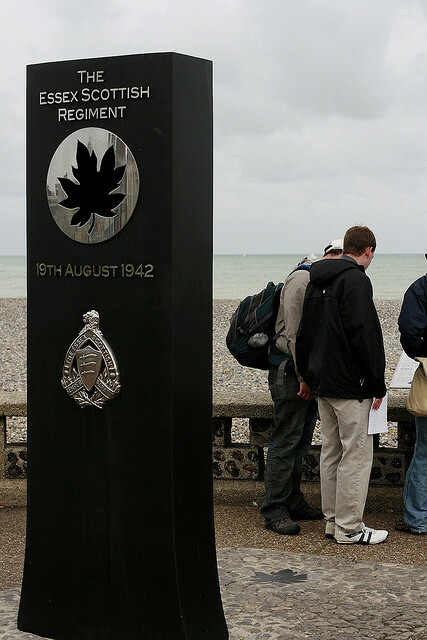 More than 4,000 people attended the official ceremonies in Dieppe, France, on Sunday 19 August, including 20 Canadian and British veterans of the raid. Attendance was also unexpectedly high at ceremonies in the United Kingdom and across Canada. The ill-fated raid and the commemorative ceremonies also received substantial coverage on TV and in major newspapers in Canada, the UK and the USA. Diantha Parker, writing for the New York Times, briefly described the raid and the historical controversy surrounding its failure for a mainly American readership that was unlikely to have detailed knowledge of the Dieppe raid. Her account, syndicated in papers across the United States, interspersed testimony from surviving veterans with an examination of the purpose of the raid and the reasons why it went so horribly wrong. 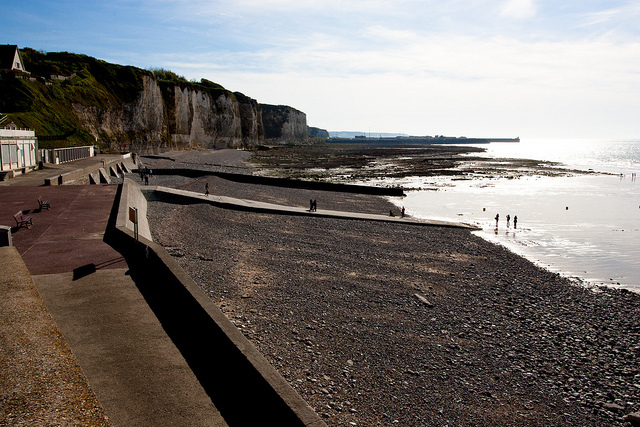 She left her readers in no doubt that the sacrifices made by the men who fought and died attacking Dieppe is still important, even to a professional journalist who, some 70 years on, researched the planning, conduct, and aftermath of the raid. Diantha’s father, Stanley Parker, who died just a few years ago, was an American serving in the Black Watch Regiment of Canada. He was also one of the more than 1,900 soldiers taken prisoner at Dieppe. Did his sacrifice further the Allied cause by providing important lessons for the successful D-Day landings in Normandy two years later as Winston Churchill, Lord Mountbatten, and General Eisenhower repeatedly claimed? After speaking with David O’Keefe and learning about the Royal Navy’s secret raid within a raid to pinch the most advanced German coding machine and code books she along with the veterans she interviewed may rightly be less certain. You can read Diantha Parker’s two articles: “A Day for Canada’s Fallen in a Lesser-Known Battle” (19 August 2012) and “In a little-known WWII Battle, a Father’s Experience Becomes a Daughter’s Journey” (22 August 2012) at www.nytimes.com . Not all of the reporting on the 70th anniversary commemorations dealt with the new revelations exposed by O’Keefe. Long standing controversies over who authorised the raid, what was the raid intended to achieve, and what foreknowledge did the German have on the time and place of the raid were revisited. Gerard Gilbert, writing for the Daily Telegraph, one of Britain’s most prestigious daily newspapers, explored the motivation behind the Allied attack on Dieppe. He is unequivocal in his assessment that by any measure of effectiveness the Dieppe raid was a disaster for the Allies. He notes that “a 6,000-strong force of Canadian and British troops lost 4,131 men killed, wounded or captured in just six hours and 106 RAF aircraft were destroyed along with the [Royal Navy] destroyer HMS Berkeley.” Not surprisingly, the Germans were confused about the motive behind the raid rightly claiming that it was “too big for a raid and too small for an invasion.” Gilbert asked a number of veterans of the raid what they achieved. Most were scathing in their criticisms of the planning and execution of the raid. For them it was “a vision of hell” and it was “crass stupidity to think that by frontal assault you could take an enemy-held port.” Others were less bitter and despite the heavy losses suffered maintained that the raid was “vital to the success of D-Day, particularly in the development of floating artificial harbours.” (http://www.telegraph.co.uk/history/9483651/The-Dieppe-Raid-the-forgotton-D-Day.html). These themes are reflected in Michelle McQuigge’s Canadian Press article for Metro News, which also addressed the wider context of the war by the summer of 1942. It was a difficult period of the war for the Allies. McQuigge based her article on an interview she had with Michael Bechthold, the managing editor of Canadian Military History and an academic historian on staff at the LCMSDS. Bechthold outlined how the Allies had suffered in both the Battle of the Atlantic and the desert war in North Africa. The Dieppe raid, he continued, was a clear signal to Germany that “we’re still in this fight and we’re not going to back down.” The Russians were also struggling to stay in the war as the Wehrmacht prosecuted its summer offensive Case Blau towards Stalingrad and the rich oil fields in the Caucasus. Stalin was in desperate need of urgent help and he implored his British and American allies to open a second front, a message that the British and Canadian troops embarking for the Dieppe raid got from British communists who raised a large banner that said “Start the Second Front Now!” just outside the entrance to Southampton docks. The Dieppe raid came at a good time politically for Churchill and the Western Allies, and the raid’s wide range of operational objectives seemed reasonable to the planners who believed that the combination of surprise and light resistance would ensure success. The failure of the raid makes these planning assumptions look foolish but the combination of urgency to do something and the multifarious objectives of the air, land, and maritime forces deployed—including naval intelligence’s desire to capture German coding equipment—clearly show that this operation had its genesis in a larger strategic purpose. In the next segment of this blog, I plan to discuss what the Germans knew about the raid before it occurred and their reaction to it after it happened.